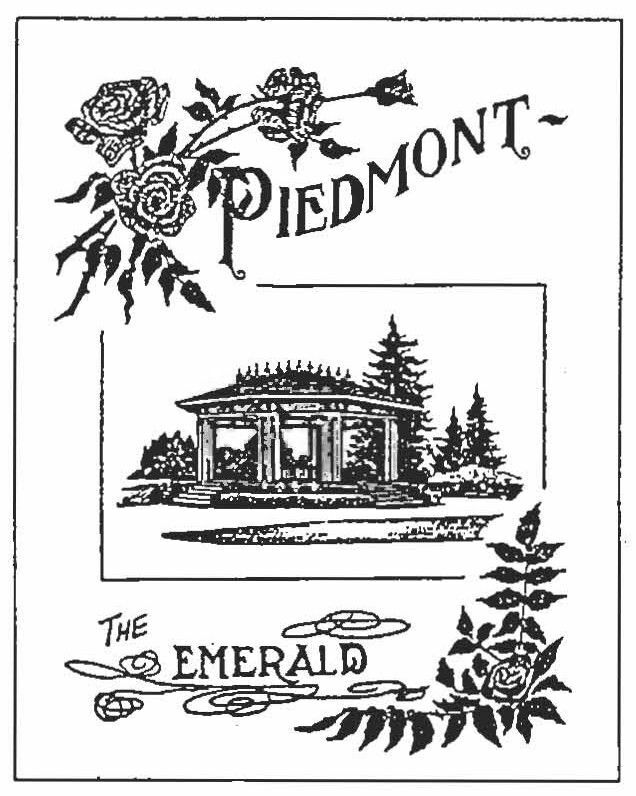 The Piedmont subdivision was platted in 1889 by Edward Quackenbush and promoted in an early flyer as “The Emerald, Portland’s Evergreen Suburb, Devoted Exclusively to Dwellings, A Place of Homes.” The original subdivision is now known as “Historic Piedmont”, and includes parts of the Humboldt and King Neighborhoods, as well as the modern Piedmont neighborhood south of Rosa Parks Way (formerly Portland Boulevard). The quarter section of land which later became Piedmont was granted to Henry Walsh by the United States Government on March 10, 1866. Pursuant to an 1885 act of Congress, this land was a Bounty Land Claim for his military service in the Mexican-American War. After changing hands several times between 1870 and 1888 with many legal questions over ownership, the entire parcel was sold for $24,000 to The Investment Company on June 22, 1888. Before this purchase, The Investment Company was incorporated on October 1, 1887, by Edward Quackenbush, William M. Ladd, William Wadhams, and S. P. Lee with the primary intention of investing $25,000 in real estate. This tract was called “Piedmont” due to its topography and mountain views. The Investment Company invited the Portland and Vancouver Railway Company to extend its tracks to Piedmont. This was done by deeding the railway company a 20 foot strip of land along Piedmont’s eastern edge under the condition that a railway line be built and maintained within that strip which is now Martin Luther King Jr. Boulevard. In September 1888, the first rails were laid and ran east of the Piedmont Subdivision up to Portland Boulevard (now named Rosa Parks Way) where the route angled northeast into the Woodlawn area and on to the Columbia River. 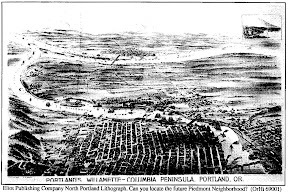 On October 15, 1889 Piedmont was officially platted and deed restrictions and conditions of sales recorded for those desiring to settle in perhaps Portland’s first planned community. The plat included 15 feet wide alleys that ran north to south. All water, gas, and sewer pipes as well as all electric, telegraph, and telephone lines except where absolutely necessary for street lights, were confined to the alleys. Electric and horse cars were allowed on any street as long as there was consent of two-thirds of the street’s property owners. The electric system was provided through an exclusive contract between The Investment Company and the City of Albina. This franchise was the last civic act of the independent City of Albina before it incorporated with Portland and East Portland in 1891. The Investment Company also established a local water system to serve the Piedmont area. The Company drilled a 200 foot well and erected a large wooded water tower on Portland Boulevard and Williams Avenue. The structure itself became a well-known landmark. The water tower was over 100 foot high and also contained an observation deck and an assembly hall. 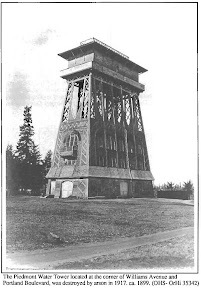 The water tower was destroyed in 1917 by an act of arson. The amenities provided by the developers were accompanied with development regulations and deed restrictions that were designed to create a high quality, strictly residential neighborhood. Homes had to be built at least 25’ from the street and 15’ from the side lot line. A minimum construction price for a house was set, depending on the lot, at $2,500 or $3,000. Industrial and commercial buildings were excluded from the neighborhood. 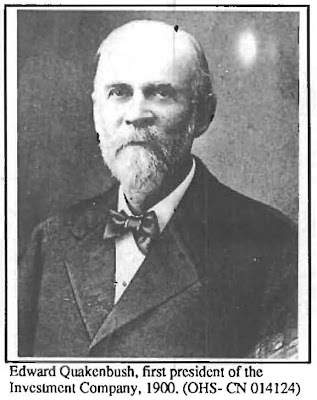 Also evident is the strict prohibitionist viewpoint of Edward Quackenbush, president of The Investment Company and organizer of the Portland Anti-Saloon League, which precluded any piece of Piedmont property to be used “for the purpose of manufacturing or vending intoxicating liquors for drinking purposes.” The Piedmont Subdivision was one of the first instances of such amenities and regulations in the Albina community. Other areas that developed in this similar pattern are Irvington and Mock’s Crest Subdivision in the Arbor Lodge Neighborhood. Development of the entire subdivision was rapid. Between 1891 and 1907, each of the boundary streets were extended, except Commercial Avenue. By 1909, over 140 dwellings had been erected. The residents were primarily upper-middle class professionals who owned their own homes. Most of the workers commuted into Portland, but a few were employed by the Swift Meat Packing Company and the Monarch Lumber Mill, both located in the Kenton neighborhood along the Columbia Slough. The pattern of primarily upper-middle class residents remained up until the 1940’s. During the second World War, Kaiser Shipbuilding Corporation recruited large numbers of workers into the area. Quite a few of these workers moved into the Piedmont area to be close to the shipyards at Swan Island. This introduced more renters and the area was no longer strictly owner occupied. Overall, most of the original large, single family dwellings remain in good condition. There has been very little incompatible mall development in the heart of the Piedmont Subdivision; less than ten structures. There have been about 100 houses scattered throughout the district, built between 1940 and 1967 that are compatible with the early homes. With the exception of the Piedmont Presbyterian Church and commercial structures along Martin Luther King Jr. Boulevard and Killingsworth Street, the area is exclusively a residential neighborhood. The houses in the Piedmont Subdivision were originally owned by upper-middle income residents. 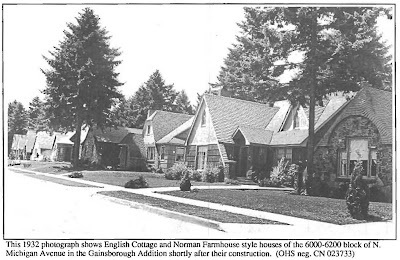 The last section of the Piedmont Historic Design Zone to develop was the Gainsborough Subdivision. This residential area is eight blocks bound by Portland Boulevard (now named Rosa Parks Way), Albina Avenue, Ainsworth Street and Minnesota Avenue. The homes were built in the late 1920s and 1930s and all have English Cottage and Norman Farmhouse style elements in their design. Most of the houses were built during the depression and are small one and two story structures. The craftsmanship of the brick facade detailing and the leaded glass windows is exquisite. At the time of their construction the area was considered a “Street of Dreams”. In the early 1960s two and a half blocks of the Gainsborough Subdivision were cleared for the construction of the Minnesota Freeway (Interstate 5 runs along what was once North Minnesota Ave.). Some of these homes were moved to vacant lots around the area. The freeway runs along the western edge of what remains of the Piedmont portion of the Gainsborough Subdivision. Even though the freeway is depressed at this point and the State Highway Department is constructing a sound wall, it still has adverse impacts on the area. Despite the freeway, this area has remained in good condition with a high level of home ownership. The site for Peninsula Park was identified in the Park and Boulevard Plan for the City of Portland developed by the Ohnsted Brothers in 1903. The seventeen acre park was purchased by the city in 1909 for $60,000 with funds raised in a 1908 bond issue. Originally the site of “Liverpool Liz’s Place,” it had been a roadhouse and racetrack for quarter-mile horse racing. An auto-park and campground were also included in the original parcel. The park was designed by architects Ellis Lawrence and Onnond R. Bean and developed in 1912 as a part of Portland’s City Beautiful Movement. The formal rose garden in the south portion of the park was designed by Emanuel L. Mische, a famous landscape architect, Portland Park Board member, and later city commissioner. The rose garden was the showplace of its time, with 300,000 visitors in its first year. The official Portland rose, named “Mme. Caroline Testout” was cultivated in this garden. This rose, once planted by the thousands along the streets of Portland, earned Portland the name, “The City of Roses.” In 1913, floral enthusiasts selected Peninsula Park as the location for an annual rose show. In 1917, Washington Park on Portland’s west side was selected as the site of the International Rose Test Gardens and most of the rose show activities were moved there. Overlooking the rose garden is an octagonal bandstand that was constructed in 1913. The bandstand is a National Heritage historical structure and was designated a Portland Historic Landmark in 1973. It is the last of its kind in the city. The community center, at the north end of the park, is Portland’s first and oldest community center. The Portland Lavender Club, a dance and social group for women over age fifty, originated here. The community center contains an outdoor swimming pool, assembly hall and two gymnasiums – one for boys and one for girls. 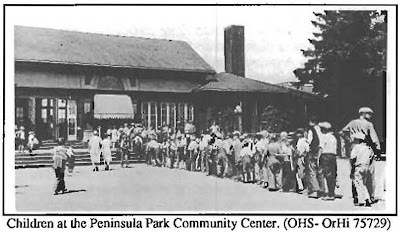 In 1915 Peninsula Park’s yearly attendance far surpassed any other municipal playground. Physically, Peninsula Park remains relatively unchanged today. There have been some minor changes over the years, with the addition of a soccer field, picnic shelter, and other recreational facilities. The playground has been renovated with funds from the 1990 parks levy. For more info about the park, visit the Portland Parks and Recreation web site. Click HERE for a map to the park. Built in 1913, this Italian-villa style facility was the first community center in the Portland park system. Its original floor plan was perfectly symmetrical, consisting of two pools and two gyms – one for men, the other for women. Such separate-but-equal social attitudes were also reflected in the entryway murals: young men featured in the area leading to the men’s side, and young women on the women’s side! -For more info on community center, visit the Portland Parks and Recreation web site. –Click HERE for a map to the community center. -For more info, visit the Portland Parks and Recreation web site. –Click HERE to see the park on a map. Now know as Rosemont Commons, Villa St. Rose Convent is the former convent and school for girls closed for good in 1993 and fell into disrepair before the Georgian-style building and its 7.7-acre site were purchased by the Portland Development Commission (PDC) in 1998. The Villa St. Rose convent was designed by renowned Portland architect Joseph Jaccoberger and constructed in 1917. The Villa St. Rose and now listed on the National Register of Historic Places and has been renovated as a $22 million, 100-unit low-income senior rental housing faculty renamed Rosemont Commons. The Commons is located at 597 North Dekum Street. In the early 2000s, Piedmont Neighborhood Association was instrumental in working with the PDC to plan the redevelopment of the Rosemont site into an urban village for all ages, and incomes. Besides the Commons, there are 18 family rental town homes; 10 Habitat for Humanity homes; six Home Ownership a Street at a Time (HOST) homes, and 10 market-rate houses. An Albina Head Start facility in planned to serve infants and pre-schoolers beginning in the fall of 2004. -For Rosemont Commons’ home page, click HERE. -Click HERE for a map.